Roasted Peppers are an amazing addition to many dishes, from salads, sandwiches, antipasto platters, to romesco and humus, roasted peppers the options are limitless. 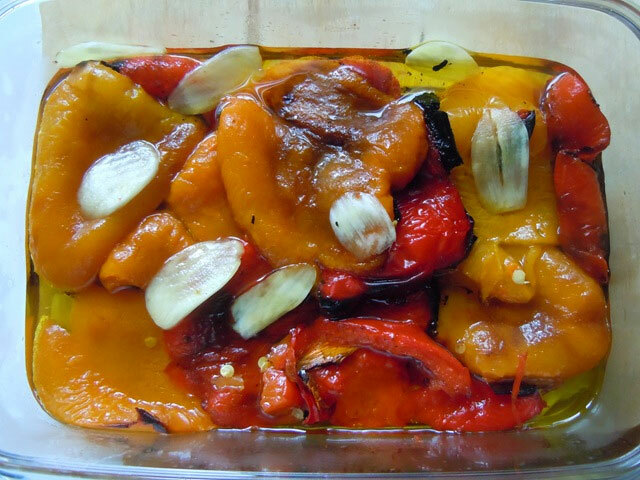 Here is a great simple way to roast peppers and serve them on there own! Preheat oven to 450°F. Place peppers on baking sheet, drizzle with Lykovouno EVOO, be sure to evenly coat the peppers. Place peppers in preheated oven. Check in 15 minutes, Peppers will begin to char, carefully turn peppers. Remove from oven after 30 to 40 minutes or until peppers are completed charred. Carefully place peppers in a large bowl, cover with cling wrap, alternately place peppers in a plastic storage bag or in a brown paper bag (sealing peppers as they cool facilitates easy skin removal). Cool for at least 20 minutes. Peel charred skin by hand, use paring knife to scrap away any remaining skin. Cut peppers in half, removing all seeds and stems. Arrange peppers in a shallow serving bowl, pour remaining Lykovouno EVOO over peppers, add salt and pepper. Garnish with thinly sliced garlic.